A woman charged with killing Kim Jong-nam, the half-brother of North Korea's leader, says she was paid to take part in a series of pranks before his death. Siti Aisyah, 26, says she was told to sneak up behind people in airports and wipe baby lotion on their faces. Mr Kim died last February at Kuala Lumpur airport after highly toxic VX nerve agent was rubbed on his face. Ms Aisyah and her co-defendant Doan Thi Huong have pleaded not guilty to murder and say they were tricked. Defence lawyers say the pair had been paid to take part in similar pranks at airports, hotels and shopping malls in the days before Mr Kim's death. A lawyer representing Ms Aisyah told the court in Malaysia that she had been paid 4,000 Malaysian ringgit (£730, $1,020) by a North Korean to fly to Macau where Mr Kim was reportedly living in self-imposed exile. He said the trip was arranged so she could play pranks for a reality TV programme, but it was cancelled for unspecified reasons. Ms Aisyah sent a text message five days before Mr Kim's death telling a friend she was going to Macau for "shooting", police say. Pyongyang has denied any involvement in the 13 February killing, but four men - believed to be North Koreans who fled Malaysia on the day of the murder - have also been charged in the case. CCTV footage from the departure lounge of the airport shows two women approach Mr Kim before placing something over his face. They are being watched by a group of seated North Korean men, thought to have been their "handlers", who subsequently boarded flights to various destinations. 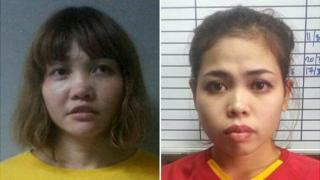 But Ms Aisyah and Ms Huong were quickly arrested. They face death by hanging if convicted. Kim Jong-nam was largely estranged from his family, after being bypassed for inheriting the leadership in favour of his younger half-brother, Kim Jong-un. He spent most of his time overseas in Macau, mainland China and Singapore. Who could organise VX murder?